The calculators below can be used to calculate electric motor amps, horsepower and 3-phase kVa. FLA - "Full Load Amps" - amount of current drawn when full-load torque and horsepower is reached for the motor. FLA is usually determined in laboratory tests. Note! - in the calculator above FLA is RLA + 25%. Engineering ToolBox, (2005). 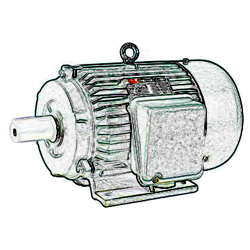 Electric Motor Calculator. [online] Available at: https://www.engineeringtoolbox.com/electrical-motor-calculator-d_832.html [Accessed Day Mo. Year].